Who was she really? Just a woman known by her sexual roles–either virginity or reproductive ability? Or was she more than a stereotype, was she a living thriving person with a unique personality? Was she a Goddess in her own right? She fills the role of Sacred Feminine, providing more than half the world’s population (women) with a Goddess to identify with, a female role-model to strive to be like. It is most disconcerting to think of god as only male. Think of the profound damaging effect the doctrine that only half the population is made in the image of God has had on Christians everywhere. How can the Creator be the same gender as men, but not the same as women? Are men that much superior to women? Are women somehow inferior to their male companions? Is the Creator that limited that “He” knows nothing of girlhood, motherhood and wisewomanhood? If there is a divine masculine force there must surely be a divine feminine force to balance it, not to mention keep it company! God doesn’t want to be our single parent, and we shouldn’t want to be “raised” in a single-parent family. He wants his Goddess, and wants us to remember Her alongside Him. Our Creators are a Father-Mother God. When God and Goddess decided to take the flesh here on earth to get things done (every couple thousand years they seem to do this) they chose Mary as one of the humans they could channel through. You remember she was asked and agreed to the task. 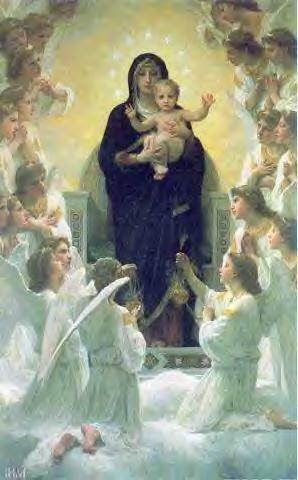 The Mother Goddess came and actually dwelt within Mary of Nazareth’s body in order to give birth to the masculine god. And then a few years later, somewhere across the Sea of Galilee in a little merchant town called Magdala (still a village in Israel today) perhaps the Great Goddess also came long enough to give birth to Mary Magdalene, the feminine messiah. They are a team, goddess and god; two fascinating forces of the universe that complement each other, strive to work together, balance the energies that flow all around us and throughout the cosmos in which we live. God and Goddess are that in which we live, move, and have our being. Sophia-Maria A Holistic Vision of Creation by Thomas Schipflinger, which asserts that the Virgin Mary was the physical manifestation of Sophia just as Yeshua was the manifestation of the Logos. This book does a superb job of exegeting the Hebrew Wisdom literature and of linking it with Mary as she is depicted in the Gospels, Acts and some of the Gnostic sources. Spong to continue to write and share his views with a wider range of readers. Here is another article on our website about Mary’s earthly life as a possible Temple Priestess. Priestesses, Mother Mary and Mary Magdalene? I believe that together they work in all worlds of matter and spirit. I believe that Mary is the Maiden Goddess. I believe that Mary is the Mother Goddess. I believe that Mary is the Crone Goddess. I believe that Mary is the Nisut. I work to imitate those cycles that Mother Mary displayed in her life. 1. Does it make sense that all it takes is the existence of a masculine divine force to prove the existence of a feminine divine force? Why? Keep in mind that church history never calls God-the-Creator a neuter entity. He is always male. 2. How has the exoteric church defined Mary the mother of Yeshua in only sexual roles? What roles have they stripped her of? 3. Name one way in which Mary was “sanitized.” Explain the reasons why the church might have done this, and then explain the ill-effects this unnatural sanitization had on Christians everywhere, and thus our de facto Christian western culture. 4. Look at the picture of Mary at the top of this page, then peruse some other Mary art elsewhere on the Net. Notice the ever present moon symbol, and that she is often shown wearing a blue outer robe, the color of the divine because she took on divinity. (Yeshua is often shown wearing red because he took on humanity). Is this how you view or picture her? Please describe her as you see her in your mind’s eye. Mary page from the Chapel of Our Mother God website.